The inaugural edition of the Yachting Malta Awards was held on Friday 17th February, 2017 in the presence of over three hundred stalwarts and key stakeholders of the yachting community as well as the Minister for Finance Hon. Prof. Edward Scicluna and Parliamentary Secretary for Research, Innovation, Youth and Sport Hon. Chris Agius. Nominated by the general public, the seventeen nominees vying for the ‘Outstanding Contribution for Yachting Award’ stood in a highly competitive field of outstanding performances in their respective careers. The list of nominees included sailors, entrepreneurs, powerboat champions, photographers and media personalities. 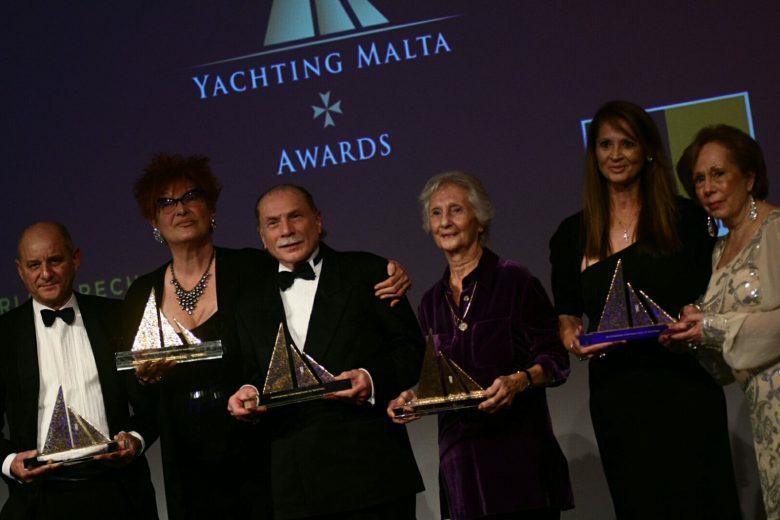 The Outstanding Contribution to Yachting Award was created specifically for the inaugural edition and is considered to be a beautiful representation of Maltese craftsmanship. The first set from a series of ‘Outstanding Contribution to Yachting’ Awards were awarded to six individuals who through their commitment, contribution and efforts, shaped the yachting community – as a sport and industry, as it is today. “Reading through the wide spectrum of nominations is a powerful reminder of the commitment and contribution the seventeen nominees embarked up. Choosing the six winners of the ‘Outstanding Contribution to Yachting Award’ was not an easy task however the judging panel felt that as a first event it was appropriate to award the pioneers of the industry and sport who through their efforts set today’s scene and built a strong foundation for the future” enthused Wilfrid Buttigieg, CEO of Yachting Malta during the Awards Gala Dinner. Arthur Podesta – presented by Mr. Michael Darmanin, representing Charles Grech Limited to Mrs. Kristine Podesta. – Arthur Podesta’s association with the Rolex Middle Sea Race goes back to the very start, when he was present at the inception meeting for the race, he was the only sailor to compete in all of the first thirty-five editions of this race. He devoted many years of his life to the Royal Malta Yacht Club as an active member, committee member and even Commodore. He was renowned for his experience, skill and knowledge and remains an inspiration to all who knew him. Roland Darmanin Kissaun – presented by Mr. Ivan Sammut, Yachting Malta Board member and Transport Malta representative to Mrs. Doreen Darmanin Kissaun. – Roland Darmanin Kissaun worked hard to see Malta become one of the most successful Yachting hubs in the Mediterranean as we know it today. Roland was a pioneer promoter of Malta Flag Registration for yachts and together with Ing. Paul Cardona contributed towards the development of Commercial Yacht Registration. Roland was also a mainstay behind the organisation of the Malta-Pozzallo Windsurf Race (1983-1994) and the Malta-Tunisia Yacht Rallies held in the 90’s. Paul Ripard – presented by Mr. Simon Debono, representing Simon Estates to Mrs. Dora Ripard. Considered to be one of the principle pioneers of yachting in Malta, he was one of the first, with his brother John to open a yachting agency in Malta. Paul was also among the founders of the Middle Sea Race. In 1960 Paul was the youngest member of the contingent representing Malta in the Olympics when, with his brother John, represented Malta for the first time in the Star Class category. Paul’s expertise and his passion for sailing was shared amongst the countless successful Maltese sailors he taught and mentored. John Ripard – presented by Mrs. Bernadette Bonnici Kind, representing Mercedes Benz to Mr. Godwin Zammit, Commodore of the Royal Malta Yacht Club. John Ripard’s sailing expertise saw him represent Malta in the 1955 Mediterranean Games in Barcelona and the 1960 Olympiad, he participated in the Star Class. In the early 80’s his international judging career took off which saw him Chair the Race Committee for the Louis Vuitton Cup at the 1987 America’s Cup as well as several America’s Cup Juries. He was appointed Chairman of the Yacht Marina Advisory Committee and under his watch the first Floating Pontoon Yacht Marina was created in Msida Creek. In the 1992 Republic Day National honours he was given the ‘Midalja Ghall-Qadi Tar-Repubblika’. Wilfred Sultana – presented by the Hon. Parliamentary Secretary Chris Agius Wilfred Sultana enjoys an esteemed career with a forty-eight-year span and has been recognised on several occasions. He has been involved in the organisation of a variety of high profile events, such as the Malta-Pozzallo Windsurf Race, the Wishbone Windsurfing International Championship, the ‘off-road’ Camel Rally Malta, the Malta-Tunisia Yachting Rally, and World Ranking snooker tournaments. He is the founder editor and publisher of ‘Yachting in Malta’. Teddie Borg – presented by Hon. Minister Prof Edward Scicluna to Mrs. Roselle Borg. Teddie Borg was a pioneer in promoting sailing on the Maltese media. His work was proactive as he did not merely ‘report’ what happened, but created programmes that brought the spectacle of water sports to the general public. and might we add most people came to know of sailing through his programmes. He was also chairman of the UIM Malta Powerboat Federation and was instrumental in bringing the P1 event to Malta.